Ichol Plus is indicated for constipation, hypercholesterolemia, gall and kidney stones, blocked bile duct, gout, jaundice, hepatitis, duodenal ulcers; and for symptoms associated with premenstrual syndrome, menopause, endometriosis, arteriosclerosis, hypertension and hypotension. 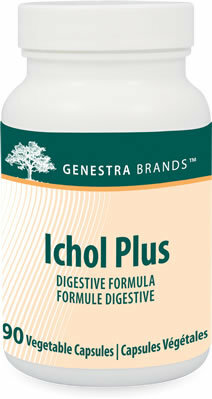 Ichol Plus combines lipotropic factors, ox bile and synergistic herbs specially selected for their ability to regulate fat metabolism, remove toxins and metabolic wastes, and support the liver, gall bladder and common bile duct. Fatty accumulation in the liver interferes with cholesterol metabolism and hormonal balance, resulting in fat deposits in the liver and circulatory system, which can lead to endometriosis, premenstrual syndrome and coronary disease. Ox bile is necessary for the digestion of fat and the assimilation of fat-soluble vitamins, as well as to stimulate the bile flow, thereby preventing constipation. Guaranteed to contain no added wheat, starch, yeast, gluten, corn, soy, sodium, sugar, artificial coloring or flavoring, preservatives or dairy products.